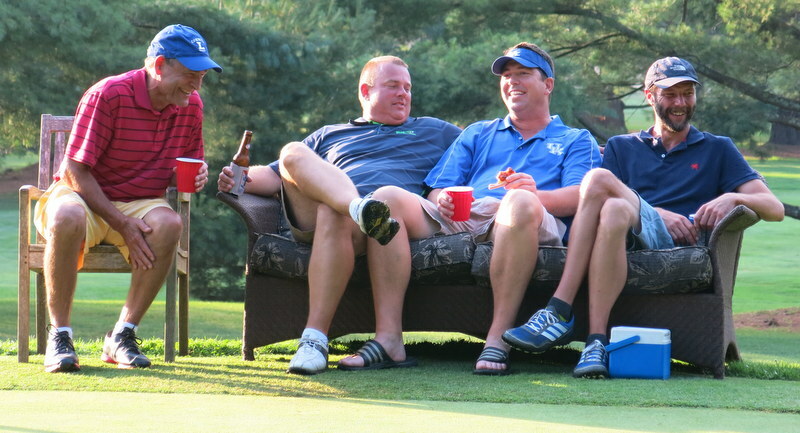 Peter P, Rob G., Fritz, Klinger, Scribby, ringside at the putting contest. These guys are pretending to eat salad. Their steaks are still on the grill. 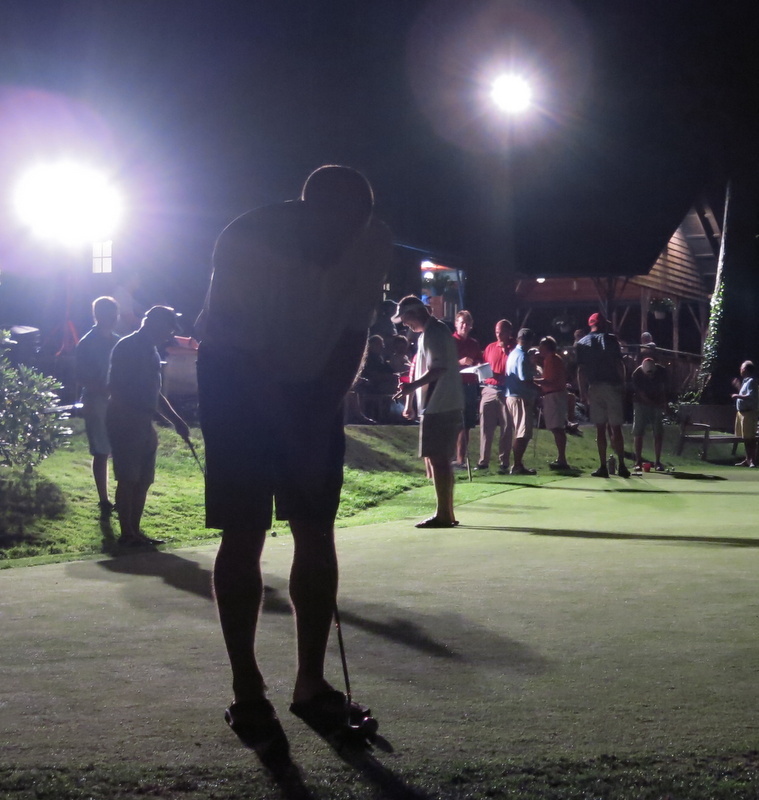 Some of the most stirring action took place after dark on Friday night, under lights provided by C.J. A qualifying round was two times around a four-hole course. Each each hole was a par-2. The green had been triple-cut and rolled, and all the holes were within a few feet of the fringe. If you putted a ball off the green, you had to pay a penalty stroke to move it back. The format was best-ball. In two days of trying, no pair went around in better than two under par. 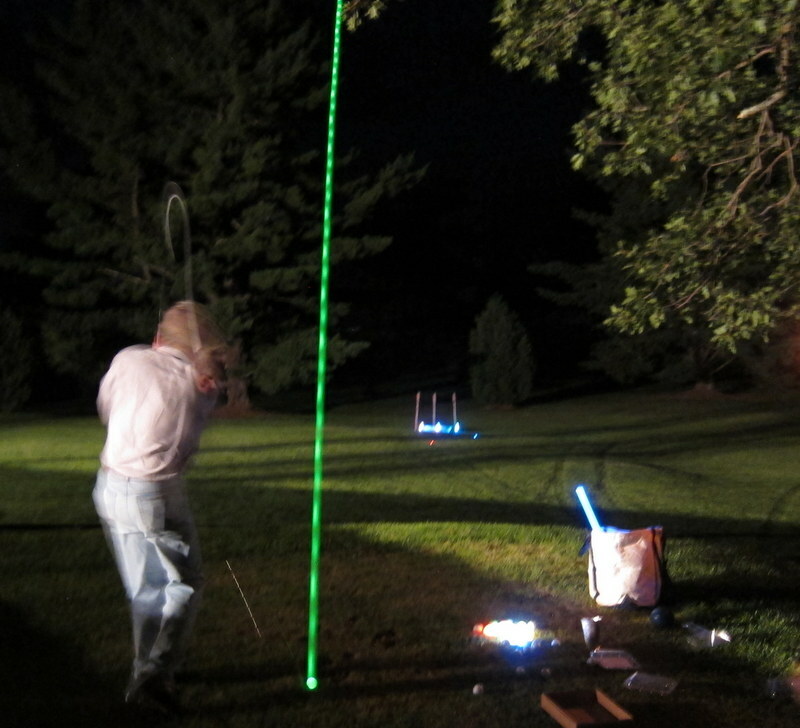 We also had an after-dark pitching contest, using Night Flyer balls. The target was a small kiddie swimming pool, which my wife bought for our dog but our dog, so far, doesn’t like. The kids in the golf shop had filled it with water and glow sticks, and they had marked it with Tiki Torches and flashing LED things that looked like tent stakes. You got three tries for five dollars, and if you made a ball stay in the pool from forty-five yards away you won half the pot. Doing that was harder than it sounds, because only one person managed to do it: Tim. But even the misses looked cool, and in some pictures my brother took they look like those tracking shots on TV. 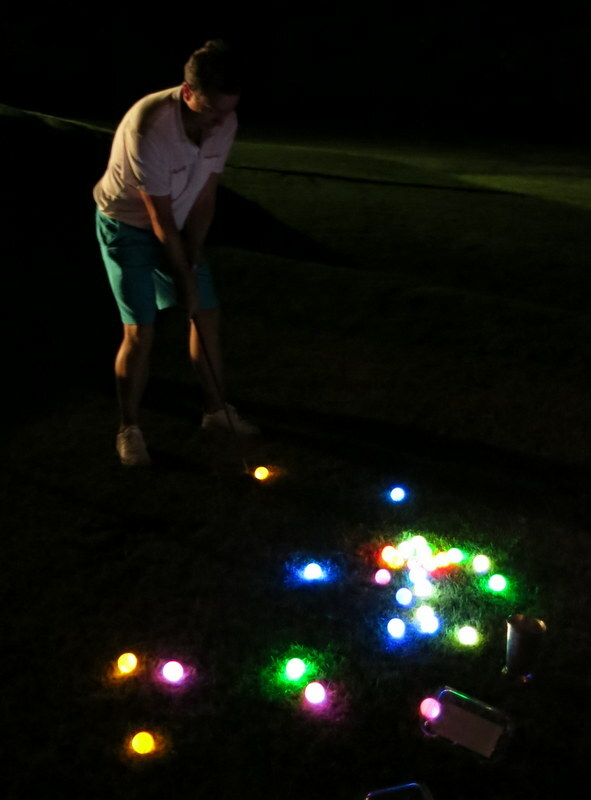 Night Flyer balls look like regular balls, but they light up when you clack them together or hit them with a club. Putting-contest tickets were ten dollars each. You paid for them at the cashier’s desk, which was also the pari-mutuel betting window for the regular golf matches. 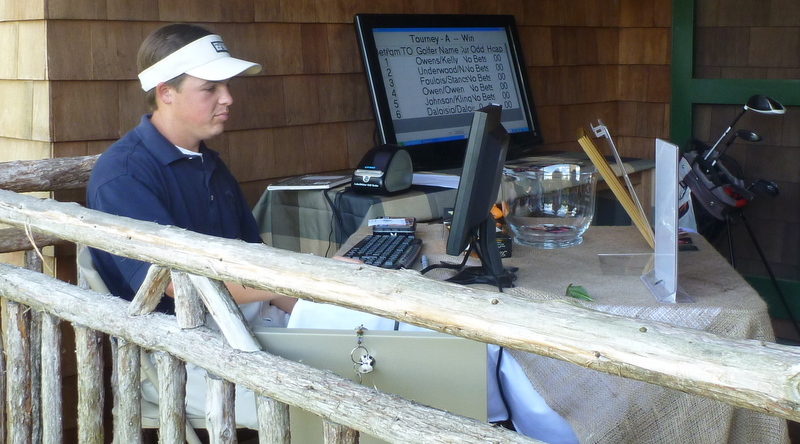 Michael U. handled the bets, using a computer program called Backnine Bookie. The program kept a running tally of the odds for every pair in the tournament. You could bet on yourself, and on other teams in any flight except your own flight—a rule we imposed to eliminate any temptation to tank matches. Michael used our handicap-card printer to print a ticket for each bet. Joe, Rob G., Chic, Peter P.
This entry was posted in Games, Sunday Morning Group by David Owen. Bookmark the permalink.